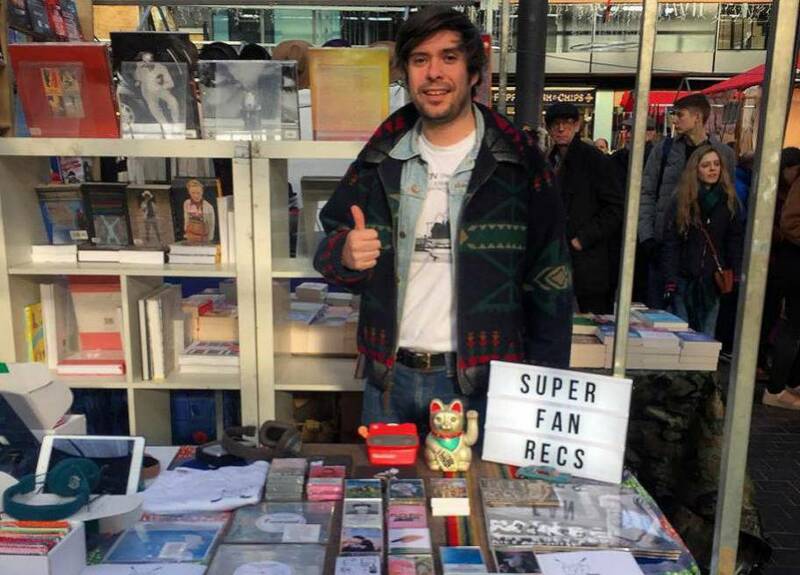 At the label market with Super Fan 99 imprint operator Luke Barham (oka Uncle Luc); press photo courtesy of the label. The Long Fall’s Amy Rieckelman; press photo courtesy of the artist. Presenting the debut single “Oh Love” from The Long Fall; Amy Rieckelman commands a vocal presence where every other instrumental element bows & bends before in an organic lo-fi adorned arrangement. The rollercoaster-like ways of turbulent amor are exhibited in echoes that recall moments of togetherness, moments apart & those empty & hollow emotions that are felt beneath the glow of the moonlight or neon bulp of a bar lamp. Amy’s arrangements go from subtle to rich synths, keys & strings that strike in unison where every note slams with a full sound that encompasses an array of overwhelming sentiments. Stay with us after the listen as we caught up with The Long Fall’s own Amy Rieckelman. Walk us through how your Idaho by Chicago by LA & beyond has impacted your musical sensibilities thus far? Both of my parents sang to me. A lot. And I never minded. I saw Merrilee Rush sing at a street fest in Lewiston, Idaho when I was very young, and she just looked so happy to be surrounded by people who knew her songs. My mom, a teacher, also played trumpet in the Civic Theatre orchestra, which meant I saw a ton of musical theater at an early age. When my parents divorced, I split my time between two small towns: Yakima, Washington and Macomb, Illinois. My mom was a twenty-something obsessed with MTV, so I grew up listening to Madonna, Whitney Houston, Stevie Wonder, Phil Collins, and like most kids, adored Michael Jackson. My dad was in love with Country music, which took me longer to appreciate, but he also listened to George Harrison, thus my introduction to the Beatles. And then Grunge hit. I can still remember sitting in the back of my mom’s Chevy Lumina hearing Casey Kasem bring Seattle’s Nirvana onto America’s Top 40. I remember thinking that this was a sound that was going to change things- take music in a whole new direction. I loved it, but even through that era I grabbed onto instead the Pearl Jam/ Smashing Pumpkins/ Alanis Morissettes of that time- arguably more melody-driven angst. Then Grunge faded into more left-of-center pop, and I discovered a long-gone Jeff Buckley, and Odelay-era Beck. I was playing trumpet in my college Jazz ensemble, and had just produced music for Sam Shepard’s play COWBOY MOUTH, which I had also directed- and it was in that experience, that I knew that music was going to be my driving force through any other creative endeavor. As it always has been. After college, I took a job as a cocktail waitress at Chicago’s Indie-rock club, Schubas and experienced some of history and today’s Greats (Elvis Costello, Alain Toussant, Band of Horses, Feist, Coldwar Kids, Black Mountain), and a music scene at one of its many peaks with bands like Sybris, The M’s, Wilco, The Changes- all in a less than 300 capacity venue. It was pure inspiration every night I worked. And then the Winters seemed to never end, and I wanted to be in a more artistic city- where I felt surrounded by creativity. So I moved with some friends to LA, and luckily, again, became surrounded by one of the most diverse and thriving music scenes in the world when I started working at an equally beloved indie rock venue, Spaceland, now The Satellite. I began writing music again, and started playing bass (really,I was learning bass as I went along) in my friend Mel’s shoe-gaze band Yes Me To Death. In LA, you can find every kind of music you crave, on any night of the week. And each musician in each band may also be a woodworker, or own their own record store, or be in a tv show. Everyone here in Los Angeles, can do everything. We are Renaissance people. Some may call it trying to survive, but for me I believe we are collaborators living where our passions can be turned into something. Successful or not. That has been the most liberating thing for me here. Amy Rieckelman glancing through the vanity/rear-view mirror; press photo courtesy of the artist. We want to know everything about the making of the self-titled EP with Jason Hill in Laurel Canyon and so forth. What guided the process for your vision wise & what was it like fleshing out song sketches? Jason was one of the first people to have ever heard my early songs, one of which has made it to this first EP. And it was in that first listen, that he said he’d like to one day produce them. I was excited because as he listened and we talked through their potential production, it was as though he could articulate how I was hearing them in my head. He really put a language to what I was trying to do. And then a few busy years passed. He was working on projects with amazing established artists as well as his own brand new band, Vicky Cryer, and more touring with Louis XIV, which is how I first knew of his music. I was getting out there, into the music scene as an artist for the first time. And it was nerve-wracking, and at times embarrassing. But I just kept playing out. Which put me in front of an old Chicago friend, Justin Sconza of Walter Meego. He, like Jason, wanted to produce my songs, and write with me, and so we started getting together and recording. And I round up a few friends to form a band with us. Which was a good idea at the time because it forced me to put the songs out there and arranged… but looking back I think it was premature. Justin disliked playing out, and I wasn’t communicating the music I really wanted too, because it had yet to be created, and deep down I knew it too. And aside from writing with Justin, I was with a band that wanted to play rather than write, so it didn’t have the collaborative feel that I wanted. We had a blast, but I wanted authenticity more. And Justin decided to quit music for a while and so he headed to engineering school. And so I quit the band too. But I kept the name. I had taken nearly a year and a half to record the songs on my own, with the help of some amazingly talented musician friends- Brent Puls, Stefano Bonzi, Justin Sconza, John Pancoast, Billy Harvey, Anthony Polcino, Elijah Grindstaff- across home studios all around Los Angeles (half of those musicians are Chicagoans originally). These were the songs that helped me form a band for a while, and play some of my favorite venues across the country. Then Jason Hill and I devised a timeline that finally worked and we stayed up long nights where he took my demos and deconstructed them and reconstructed and in some cases, like in “Oh Love”- which was completely re-created. Sometimes we worked side-by side at the piano, sometimes we chatted over the phone… our guiding star was always trying to create the same sort of feel that you got when you saw a John Hughes movie- that late 80’s/ early 90’s soundtrack to teen angst. The kind of sweeping sensation that made those small heartbreaks feel so epic. He also took songs that I had previously recorded and would take away elements, in the instance of one of the songs, “Again Tonight”, the existing drums, and create this really beautiful counter melody on the bells that took the song to its completion- a song with no drums, but it does have a killer bass line, thanks to John Pancoast. There was very little that Jason would try out and play for me, that didn’t completely serve the song. My friend Anthony and I had tracked a song for the EP, that Jason turned into this massive, sonic, blast from outter space- that only Jason could have conceived. And in contrast, he re-imagined a ballad that I had written and recorded another version that I loved with Darren Robinson from Phantom Planet, but wasn’t really fitting with the new arrangements. So he made me sit down at the piano and sing it. Recorded in one take, with him adding strings toward the end. Simple in production, and in service to the song. Each song should play as it’s own little film, with the five songs on the EP, playing as its own complete movie. “Oh Love” is a single that strikes at the heart. Tell us about how you conveyed sentiments of the heart through lavish & lush sensations of sound that reverberate with an infinite & time-transcending sort of wonder. First of all, thank you!! That’s a really beautiful way of describing “Oh Love”. This is one of the first songs that I took to Justin, and we tracked the vocals you hear. We recorded that which became the first version of “Oh Love”, at his apartment in LA. What will the next project of passion & purpose be from The Long Fall? I think it has to be The Long Fall EP release show. It’s turning into an all-sensory production, hopefully done in a black box theatre near my apartment. Unless someone you know, has a chateau or castle I could borrow for a night??? I can’t wait to show everyone what we’ve been working on… I hope to have my next EP completed by the end of next year too. The songs are ready to go, and I’m excited! Essential listening & reading right now? I’m going to jump right onto the Mondo Cozmo bandwagon. That guy is amazing. He just has these songs with such a keen knack for melody in a lush, brand-new- classic production. I love it! Also, my friend Lizzie Land just released her first EP that is taking over the world. She’s the real deal, and I am so happy for her!! Reading wise- I’m all over this old book about the Civil War and Gettysburg called “Killer Angels”. I visited a few years ago, and its haunted me ever since. This book makes it seem like your right there. Fascinating. I’m a big nerd and history buff. Things to pay attention to in 2017? You mean besides watching the last two chapters of Game of Thrones??? I’m going to take a risk and just say it: anything relating to Trump and his Presidency. We all, even those who voted him in, need to start paying attention to the running of this country. What we are seeing as a result of the election, is an illumination of underlying hate that it is time we put to bed once and for all. Love must truly guide our way.